Total Energy Group and De Gier Drive Systems sign exclusive distribution agreement. 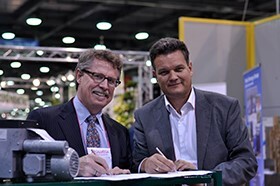 Total Energy Group will operate from two locations in the U.S.
Total Energy Group Inc. of Summerland, California and De Gier Drive Systems BV of Westland, the Netherlands signed an exclusive distribution agreement at the 2012 Ohio Short Course. De Gier Drive Systems is a family owned manufacturer of Motor Gearboxes and Rack & Pinions for the greenhouse industry. Located in the center of Dutch Horticulture, De Gier has been in business since 1954, producing drive equipment for greenhouse ventilation, hoisting and screening systems. Operating from two locations in the U.S. – Summerland, Calif. and Kalamazoo, Mich. – Total Energy Group will service and supply the greenhouse manufacturers and distributors of Canada and the U.S.